On this first full day of the Spring Season I would like to give you a preview of a new page dedicated to Wyoming’s Weather. I am in the process of making some changes to the mountainweather.com website, and will be doing some re-arranging of the Navigation. A little “spring cleaning”, if you will. As well as adding some other new pages in the coming weeks. Don’t freak out if the drop down menus change a little, the biggest difference will be combining all the Forecast Tools into the Weather Maps part of the menu, and moving things like the Weather Cams & Road Reports under the “More Weather Pages” drop down. I’ll be adding a new category to the drop down, called “Mountain States”, where direct links to the Alaska Weather, Wyoming Weather, and other State weather pages will reside, permanently. I’ll make another announcement when that change is about to be made. What’s on the Wyoming Page? 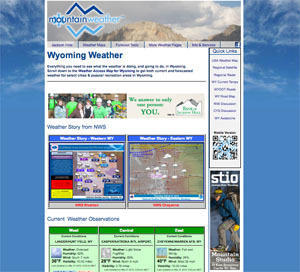 This page is designed and arranged to give you a quick overview of the current weather across the State, and a new Weather Access Map for Wyoming, with quick access to the current weather and forecasted weather for most cities, towns, and popular recreation areas. More points can be added in the future, if you have a favorite place to hike, climb, ski, bike, fish, etc., then e-mail me and I’ll see if I can add that spot to the map for you. At the bottom of the page there are a few other weather maps, concentrated over Wyoming. Let me know how you like it, as you use it for your travels across the State or for planning a weekend to a specific location. And don’t forget to click on the sponsor’s ads and see what they have going on. After all, it is their support that makes these pages possible, and free for you to use!